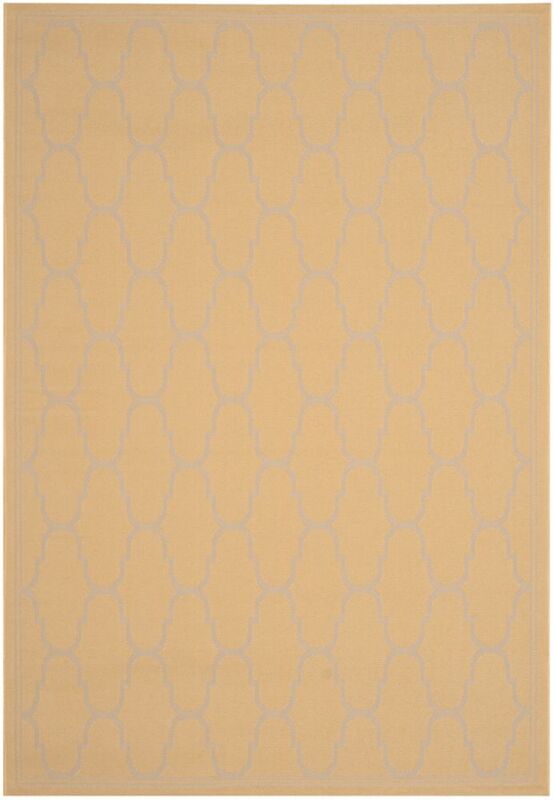 Improve the overall interior design of your living room, dining room, or hallway with this Safavieh Courtyard area rug. Decorate the right way with this indoor/outdoor piece constructed from plush synthetic material. Its machine-made construction is sure to endure the constant treading of feet and furniture. You and your guests will enjoy the lovely geometric pattern that decorates this yellow rug. 4 ft. X 5 ft. 7 in. Add this high quality Safavieh Courtyard area rug to your home for an instant splash of style. Decor does not have to be hard with this plush synthetic indoor/outdoor rug. Comfort and quality come first in this machine-made rug. Quality interior design comes in the form of this floral plants patterned beige tan rug. Modern and stylish, this Safavieh Courtyard area rug is a quality accent piece. Bring this high quality plush synthetic indoor/outdoor rug into your home to upgrade your interior design immensely. Modern style and construction is combined in this machine-made rug. Quality is assured with this geometric patterned blue rug. High quality and high style, this Safavieh Courtyard area rug is extremely useful in any home. Add this indoor/outdoor rug to your home for a comfy, yet stylish design option since it is made from plush synthetic material. High-quality and high fashion, this machine-made rug is perfect for you. This contemporary blue rug has a lovely geometric pattern for an impressive look. This stylish Safavieh Courtyard area rug is a high quality dicor option. Crafted to be an indoor/outdoor piece, its plush synthetic material is unique and comfy at the same time. This machine-made rug will make a bold statement in your home that lasts. Add this floral plants patterned beige tan rug to the dicor of your home for a contemporary infusion. Courtyard Joey Yellow / Beige 4 ft. x 5 ft. 7 inch Indoor/Outdoor Area Rug Improve the overall interior design of your living room, dining room, or hallway with this Safavieh Courtyard area rug. Decorate the right way with this indoor/outdoor piece constructed from plush synthetic material. Its machine-made construction is sure to endure the constant treading of feet and furniture. You and your guests will enjoy the lovely geometric pattern that decorates this yellow rug.